Every day we are given opportunities to forgive. Whether we’re faced with a driver that cuts us off on the freeway, a rude comment from a coworker, or our own lack of preparation for a work presentation, it is often best to let go and learn from our experiences. It’s tempting to hold onto anger and sadness as protection—to make sure we never feel a certain way again, or to hold as collateral for an apology. 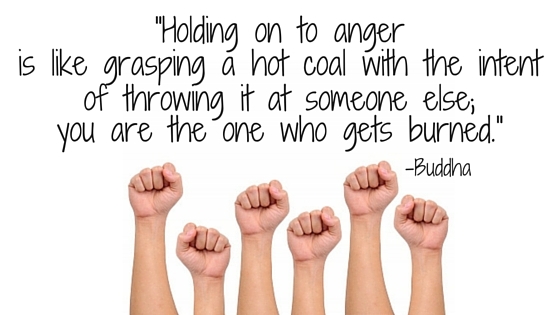 But like the analogy of holding a hot coal with the intention of throwing it, we only hurt ourselves when holding onto these negative feelings. Forgiveness is not forgetting. Practicing forgiveness does not mean you’re a pushover, and it doesn’t mean you accept negative behavior in others. There is a difference between forgiving someone, and opening yourself up to the same hurt in the future. We can all hope that offenders realize their mistake and feel remorse, but this isn’t always the case. Some people may never apologize, and we’re left harboring ill-will. Forgiveness is for your well being. You’re at the office. It’s a busy time of year, and your schedule is packed, but you decide to cut your lunch break short so you can meet with a new client for the first time. You finish your lunch and do some busywork while waiting for her to arrive. Forty-five minutes pass, and you finally see her pull into the parking lot. Right now your breathing is shallow, your fists are clenched and sweaty, your posture is hunched, and you’re angry—angry at her for not respecting your time, angry at yourself for scheduling too much in one day, and suddenly angry at your co-workers for not taking more meetings so you wouldn’t have to. This client may or may not apologize upon entering the room, but you can still practice forgiveness in order to take away a lesson from this experience, while releasing tension and stress. Forgiveness requires intention and practice, but by lowering stress you are also lowering your chances of a high heart rate, high blood pressure, body aches, depression, and fatigue. And don’t forget: mistakes are what make us human. Mistakes help us improve: our products, our processes, and our attitudes. Without forgiveness we would still be holding onto hurts from long ago—forgiveness helps us grow.